Interactives: Are you middle class in Western Europe? For the analysis – which covers the period from 1991 to 2010 and includes comparisons with changes in the United States – “middle-class” or “middle-income” adults in a country are those who live in households with disposable (after-tax) incomes ranging from two-thirds to double the country’s median disposable household income. Thus, the income it takes to be middle class varies across countries. Also, estimates in the new report will not match those in the Center’s previous reports, which were based on a household’s gross (pretax) income. 1 Among Western Europe’s six largest economies, the shares of adults living in middle-income households increased in France, the Netherlands and the United Kingdom, but they shrank in Germany, Italy and Spain. From 1991 to 2010, the middle-class share in the UK increased from 61% to 67%, but it decreased from 78% to 72% in Germany. Among the 11 Western European countries examined, the expansion in the UK was second only to the increase in Ireland, where the share increased from 60% in 1991 to 69% in 2010. The decrease in Germany was the second largest after Finland, where the middle-class share fell from 82% to 75% over the same period. Overall, the middle-class share of the adult population fell in seven of the 11 Western European countries examined, mirroring the long-term shrinking of the middle class in the U.S.
2In most countries studied, decreasing shares of middle-income populations led to rising shares of adults in lower- and upper-income tiers. These shifts signal a sharpening of economic divisions among households in many Western European countries and the U.S. However, there is also a general improvement in the economic status of adults because the movement up the income ladder was greater than the movement downward in most countries from 1991 to 2010. Among the Western European countries examined, the biggest gainers in economic status were the Dutch. In the Netherlands, there was a decrease in the share of adults in the lower-income tier and an increase in the share in the upper-income tier, which together yielded a large gain in overall economic status. At the other extreme, the increase in the lower-income share in Spain was much greater than the increase in the upper-income share, for a net loss in economic status from 1991 to 2010. 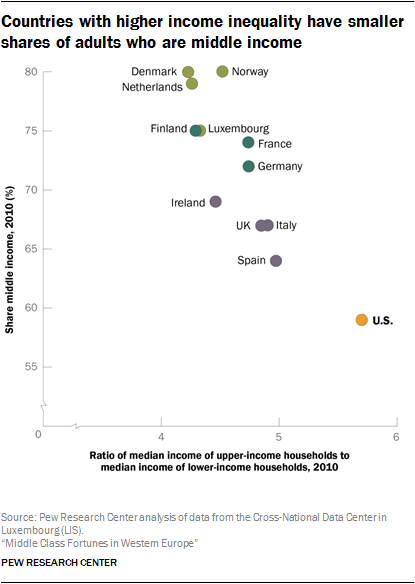 3Compared with Western Europe, the U.S. middle class is smaller. Among the countries examined, the U.S. is the only country in which fewer than six-in-ten adults were in the middle class in 2010. Meanwhile, compared with many Western European countries, greater shares of Americans were either lower income (26%) or upper income (15%). Thus, U.S. households were more economically divided than households in the Western European countries analyzed. In the Western European countries, middle-class shares in 2010 ranged from 64% in Spain to 80% in Denmark and Norway. The share of adults who were lower income was lowest in the Netherlands (13%) and highest in Spain (24%), and upper-income shares ranged from 6% in Norway to 14% in the UK. 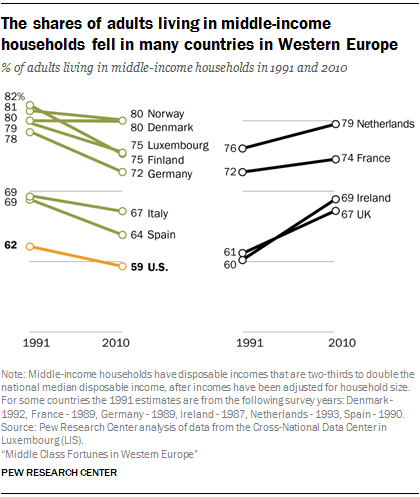 5Compared with the U.S., middle-class households in many Western European countries experienced a greater increase in income. 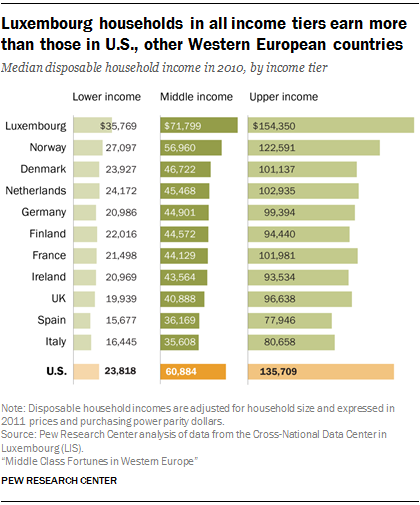 While middle-class incomes in the U.S. are greater than those of most Western European middle classes, the U.S. ranked near the middle when it came to how much that income had increased. In the U.S., the median income of middle-class households rose 9% from 1991 to 2010. Ireland, Norway and the UK led other countries in raising the incomes of households overall and of households within each income tier during that period. The median income of middle-class households in Ireland increased 71%, followed by 48% in Norway. Meanwhile, the incomes of middle-class households in Italy fell significantly (down 20%) and were virtually unchanged in Germany. This trend was also similar for the growth of the incomes of lower- and upper-income households. 6In most countries examined, the share of the country’s aggregate household income held by middle-income households fell from 1991 to 2010. The most substantial decrease in the share of aggregate household income held by the middle class occurred in Finland, where the share fell from 85% in 1991 to 74% in 2010. Other notable decreases in the share held by the middle class included Germany, where it fell from 77% to 70%, and the U.S., where the share slipped from 62% to 56%. Ireland and the UK are the only countries in which the shares of aggregate household income held by the middle class increased from 1991 to 2010. 7 Income inequality is related to the size of the middle class in a country. The shares of adults who are in the lower-, middle- or upper-income tiers in a country are related to the country’s degree of income inequality – that is, the gap between the earnings of households near the top of the income distribution and those near the bottom. Countries where incomes are more equal have larger shares of middle-income adults, and vice versa. In 2010, Denmark, the Netherlands and Norway, which had the largest middle-income tiers, had lower to moderate levels of income inequality. The U.S. and Spain stood at the other end, with the smallest middle-income tiers and among the highest levels of income inequality.